« Update: Coconut Flour $2.34 per Pound! Ooh, I love zucchini and this looks deicious and so easy! Your daughter did a great job with the picture. Thanks Janet. She’s taken an interest in photography lately. Wouldn’t be great if I had an in house photographer? This looks good! I think I just found what we are having for dinner! Thanks!! I just found your blog and I’m excited to follow your posts! (Stopping by from It’s a Blog Party) Yum. This is simple and perfect for a quick dinner and looks like it really highlights the flavors! Thanks Gaby. Hope you have a wonderful day! Following your lovely blog. You may also visit http://olahmomma.com/momlounge (Momma’s Lounge) where you can express yourself, add your business/giveaways, and meet and be seen with more mom bloggers. Thank you for another delightful way to use our garden fresh Zucchini! Your recipe sounds and looks delicious! I found you on Ann’s site: Food on Fridays! This looks fabulous. Anything with zucchini and tomatoes gets my vote. I love zucchini and tomatoes, too. Thanks for taking the time to comment. I hope you have a wonderful weekend! 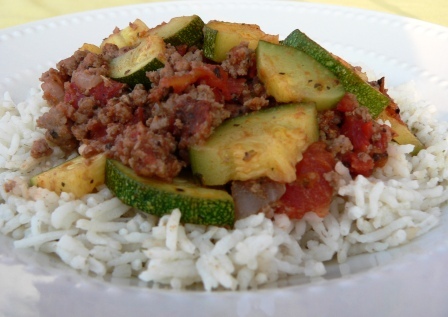 A great idea–there has been so much zucchini at the farmer’s market. Thanks so much for sharing on Friday Food on Momtrends. I love checking out all the foodie creations. Enjoy the weekend. That looks delicious! Now I know what I’m making for dinner this weekend. Thank you so much for sharing! Thanks Janelle! I hope you have a wonderful weekend! Oh my gosh, this sounds really great! Thanks for sharing with Fat Camp Friday, see you next time! That looks so tasty. Few years ago I wouldn’t touch zucchini and now I can’t get enough of them…..even my kids are enjoying it more and more. Thank you so much for sharing it at Foodie Wednesday and hope to see you there this week as well. This is a well rounded meal. You have enough heat to give that zucchini a life of its own. We are featuring this at Let’s Do Brunch, tomorrow. Come on over and please bring food for the hungry foodies. Thanks for featuring me Chaya! We just had something similar last night! all of us loved it! I’ll have to add this recipe to my box! This sounds great. Your daughter is quite the photographer!